For shortwave listening with a software defined radio, I recommend SDR Console V3 for control, display and demodulation. Although still in development, its performance is wonderful. You have heard me sing the praises of Simon Brown G4ELI before. He continues to write great software for radio listeners. Simon is perhaps best known for the original Ham Radio Deluxe. More recently, he has been specializing in commercial radio monitoring with SDR Console. Simon makes a free version of this software for use by hobbyists. 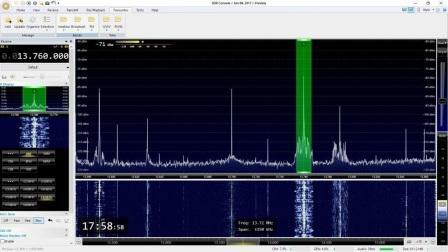 While I was setting up my new radio computer, I went to his web site to download updates, and thought I would try the preview of his new SDR Console Version 3. Although described as “unfinished”, Version 3 works well right now for everything I need to do with my Perseus receiver. Migrating to V3 is easy, and both versions can be installed on the same computer. Users will find the GUI more neatly designed and a bit easier to use. The quality of demodulation seems about the same as the previous version. You can easily adjust the bandwidth of spectrum being monitored with a simple slide control. Another enhancement is the ability to control the transmitting side of SDR transceivers like the popular Apache Labs ANAN from India. Unfortunately, FlexRadio gear is not supported. I can tune the spectrum with one click to change frequency, rather than a double click. Exalted carrier reception is available including sideband selection. This can really help with reducing interference on AM reception. Several different Noise Reduction algorithms are available, including Ephraim-Malah which is a form of spectral subtraction. I find it very effective on noisy SSB audio. You can sort out various ham, broadcast and utility bands in “Favorite” folders. A greater variety of palettes for visual display. Finally, you get a lot of ability to customize the filters, including selection of signal processing “windowing”. Overall, though, SmartSDR and the Flex 6300 give better listening audio than the SDR Console / Perseus combination. Take a look at SmartSDR V3 in action.